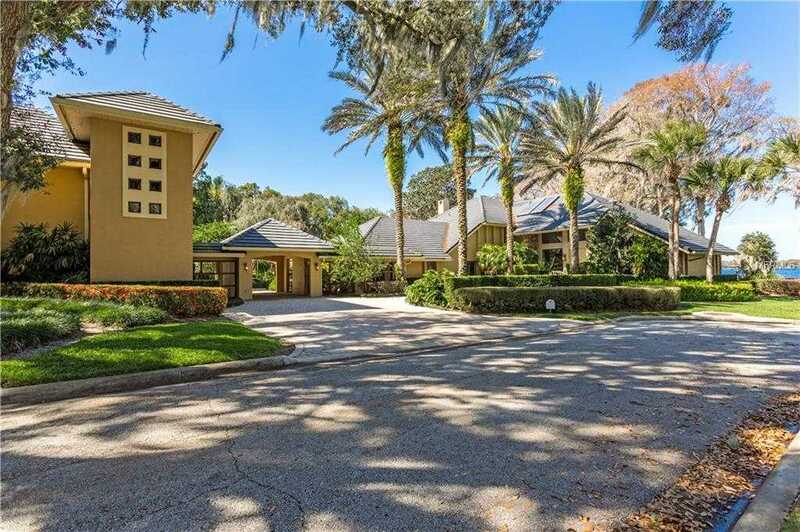 One of Winter Park’s premier Golden Coast Lakefront Estates. Walk to downtown Park Ave from this hidden, prime location situated on over three acres with 160 feet on Lake Maitland. This unique property on a quiet cul-de-sac features the main house with spectacular waterfront views and detached guest residence above 3 car garage with separate entrance from the porte cochere. Guest quarters offers full kitchen, additional bedroom, bathroom, living room, dining, inside utility and storage room. This Modern floor plan has been beautifully updated with custom chef’s kitchen, designer solid-wood cabinetry, granite, true walk-in pantry plus 15×10 inside utility with additional refrigerator, pantry and storage conveniently located on the main floor. Floor to ceiling views greet you as you enter this lakefront private retreat with warm and inviting family room off kitchen, professionally appointed with craftsman wood detail and crown molding. Downstairs guest bedroom with private bath and large media room with additional full bathroom and storage closet. Spacious second floor master bedroom features a large picture window overlooking the lake. His and Her bathrooms plus den/office, workout area overlooking Lake Maitland with stunning outdoor entertaining area leading to your own private boat dock. Enjoy morning sunrises and glorious sunsets from this one of a kind Winter Park Estate. Also excellent opportunity to expand structure per FAR (Floor Area Ratio) allowable guidelines up to 15,000 square feet!